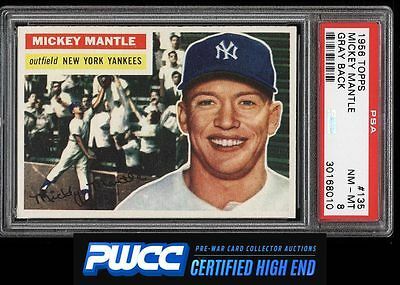 A shockingly fresh and well preserved '56 Mantle which shows many attributes of a higher grade. MINT surfaces with four NM-MT+ corners and all around great registration abound. Easily the best PSA 8 we've brokered in recent times and would not look out of place in a higher grade. Part of an entirely uniform and completely impressive PSA 8+ 1956 Topps Set Break on the auction block this week. A partial master set, comprised of 355 cards to include all Team variations. Of particular note, this set was carefully built with a special attention to centering and overall quality for the grade. The first such assembly we've brokered in recent times and represents an excellent opportunity to fill some holes in a set underway. Enjoy! One of nearly 20,000 cards, lots, and sets up for bid in our 7th Auction of 2016. Click on the link above to view the other PWCC auction lots.